At least once a week, many people head over to their local grocery store to pick up a few of their favorite foods. While most people don't pay too much attention to the price of the items they purchase, there are others who are always looking for a bargain. Whether that deal is on food, beauty and skin care products or even alcoholic beverages, it may not even matter. Just as long as they feel like they have saved a few bucks and walked away with something they wanted, they are happy. With Trader Joe's being filled with local and international products that people love, and many of them being available for a great price, it is often the first place people stop when they are in the market for certain things. Considering a lot of these items are under $3, it is actually a wise decision. Here are the best Trader Joe's products that are under $3. Who doesn't need a good, nourishing hand cream that will allow their dry, flaky hands to be soft and smooth all day. Depending on what field you work in, you may need to apply lotion at least three to four times a day. Trader Joe's Nourish Shea Butter Hand Cream is able to get the job done, and the best part is that you'll only have to pay $2 for it. It's packed full of Vitamin E, almond oil and other hydrating ingredients that are great for you skin. Everyone could use a good stick of lip balm to take of those dry, chapped lips, no matter what time of year it is. If you were to go to Walgreens, CVS or a different grocery store, you would likely be charged at least $1 for one stick. At Trader Joe's, you can purchase a 3-pack of lip balm for $2.49. That's about 83 cents for each stick. People use eggs to cook a lot of things, so this is probably an item people purchase every time they go the grocery store. At most grocery stores, eggs will be between $2.50 and up. Of course, this is dependant upon where you go and how many eggs you purchase. At Trader Joe's, you can get a dozen eggs for $1.99. Depending on what you are cooking, you will use basil to add a bit more flavor to your dish. Whether it is a lot or a little that you need, you probably don't want to spend too much on this particular item. For just under $3, you can get a container of basil at Trader Joe's instead of paying almost double that at another store. If you love bananas, then Trader Joe's is the place to go. With bananas being just 19 cents each, you can load close to a dozen bananas for under $3. 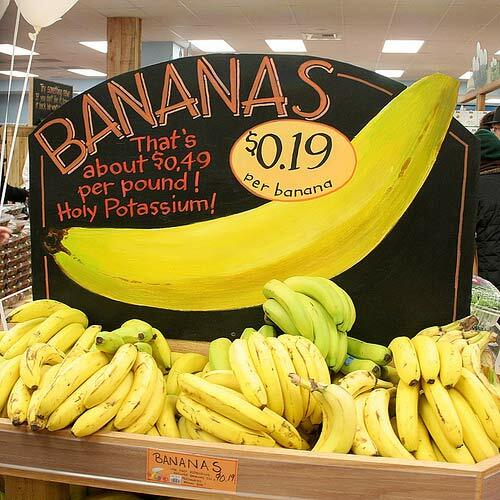 Compared to other stores, where you'll be paying at least $4 or $5 for a dozen bananas, this is a steal. Most dishes that people whip up will call for salt. Most places don't charge too much for salt, but depending on the size of the container, it can get up there in price. For just under $2, you can get a 26 oz of sea salt, which is cheaper than what you would pay another store for a smaller amount of salt. When people think of wine, they may believe that this drink is typically expensive. This is true, but it depends on what type of wine it is and where you purchase it. If you shop at Trader Joe's, you'll be able to find a bottle or two for $1.99. At most stores you visit, you find greeting cards fairly cheap, and Trader Joe's is just another one. For just 99 cents, you can find the perfect card for any occasion. This is perfect for those events that you may forget to pick up a card and don't really have time to go to Hallmark store or another location that sells greeting cards. Coconut milk is not an expensive item, but you can still purchase it for less at Trader Joe's. While other stores may be asking for $3 for a can, you can find it here for about $1. Frozen fruits are great for smoothies, which is why many people may buy them. Mangos, pineapples and an abundance of other frozen fruit can all be purchased here for less than $3 per bag. Trader Joe's may not have locations that are right around the corner from every home, but it is worth the drive considering you can save big on the items that you need. From fruit and vegetables to skin care products, you can find it all and then some. With great buys like these being less than $3, it may be hard to not think of Trader Joe's as your new favorite grocery store.